Someone Died… Now What? is a GPS for grieving. Corrie Sirota provides Guidance, Perspective and Support to help you navigate your way through the grief process. 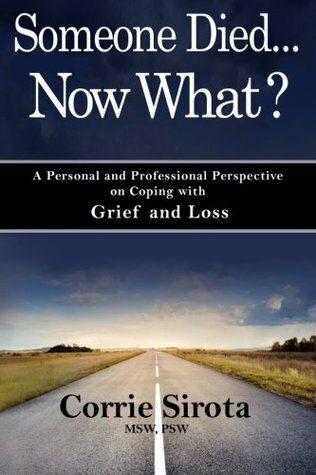 Whether someone you love has died or someone you know is struggling with a loss, this book addresses many of the issues and questions that surface, providing concrete assistance on what to do immediately following a death, how to deal with feelings of sadness, anger and guilt, non-death losses and how to support grieving children. You will learn that grief is an ongoing process, and is as unique and individual as you are. This is a very good book for anyone who has lost someone. The grieving process is different for everyone and there are plenty of myths about it. One of the myths that I know to be untrue is “A sudden death is worse than a death resulting from a long term illness”. My mother died from cancer and even though we all thought we were prepared for it, we weren’t. It was as devastating as if she had died instantly with no warning. In the beginning of the book is a chapter about the stupid things people say to you when you lose a loved one. Thankfully, no one said anything to me when my husband passed away, that I felt was stupid or hit me the wrong way. The bulk of my support came from my 3 children and 4 grandchildren. They were grieving along with me. I don’t know how I’d have survived without their support. The rest of my support came from my friends and book blogging friends. So many kind words and prayers and I can’t thank you all enough. The book lists the stages of greif as Denial, Anger, Bargaining, Grief, Acceptance. I felt all of those things, but the grief was present from even before my husband Henry passed away, because I knew it was coming. The thought of losing the love of my life was overwhelming. For me, other than the grief, depression was the biggest stage for me. I went, and still do from time to time, through periods of depression. I was Henry’s sole caregiver for almost 30 years and for most of those years I didn’t work outside the house and we were together pretty much 24/7. Not having him with me to talk to, not hearing him sing etc. is something I’ll probably always have trouble dealing with. The book also talks about how so many things can trigger sadness. That is definitely true. So many things remind me of Henry, and now of my dog Patches who I lost on Sept. 28th. She was my baby and I miss her so much. One of the most profound statements in the book for me was when the author wrote of a woman named Sari, a woman who had lost her husband, who said “It’s like a land mine. You are concentrating on something and all of a sudden, BOOM, it hits you. Hard. And you didn’t even see it coming.” That has happened to me so many times. And it’s like a fresh cut each time. The last few chapters are Creating New “Normals”, The Importance Of Laughter, The Importance of Laughter-Really, and Gone But Not Forgotten. I am starting to laugh more and am getting ready to make some changes to my life that will set me on the path to a new normal. But yes, although Henry is gone, he will never be forgotten. He was and will always be a huge part of me. This is a short book, only 138 pages, but it is packed full of so much more than what I’ve mentioned. I will be reading this book from time to time because of the comfort I felt while reading it. I definitely recommend it for any one else going through the stages of grief. I think that people are so concerned that they are going to say something stupid to a grieving person that they avoid saying anything at all. I didn’t have anyone not say something to me, and no one said anything stupid. Most people just tell you that they’re sorry for you loss. This sounds like a top notch book and one I would recommend to my Aunt Betty. While my uncle has been dead now for over a year, she still finds herself falling into periods of depression and stops going out. Your recommendation for this one holds a lot of weight with me. I think the comment from Heather holds true for many people. We worry about saying something that will be perceived as callous. My cousin lost her husband almost two years ago and she still gets depressed. I don’t think it’s something you ever get over. I lost a friend to cancer last month and this book came just at the right time. It helped me to understand many of the feelings I was experiencing. So glad you found this book helpful too! Thanks Laura. I had looked at many other books on grief but they just didn’t appeal to me. This book was just what I needed and I’m so glad it was offered to me for review. Thank you for the most touching review Vicki – I am so grateful that my book Someone Died…Now What? resonated with you. To all the others that shared your losses – heartfelt condolences on the death of your loved one.